StrokeIt is an advanced mouse gesture recognition engine and command processor. Basically, it`s a nifty little program that lets you control programs by drawing symbols with your mouse. StrokeIt can currently recognize more than 50 unique mouse gestures and can be easily trained to recognize many more. For each gesture recognized, StrokeIt can execute a user-defined set of commands within the active application. StrokeIt commands are defined within plugin libraries that can be easily created by third parties to do virtually anything. 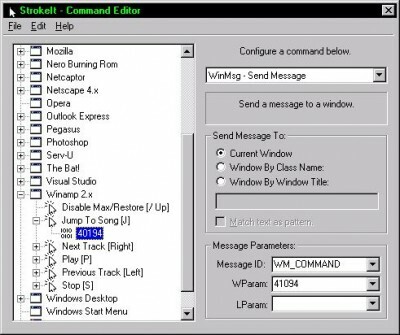 BySoft Internet Remote Control is an application that enables remote monitoring and control of a DialUp connection. Any Password is a tool that lets you store and arrange all your passwords, UserIDs, and related information in a tree form. With custom defined gestures via the SVG format, Gesture Recognition attempts to compare your hand drawings with those it knows. WebAngels is a software program which provide you some enhanced functions on IE: 1)make IE recognize your mouse gestures and execute relevant commands such as: refresh or go home. Mojo Desktop Sidekick is a click-thru pet Gecko by drawing symbols Operate your machine with a click-thru pet Gecko by drawing symbols with a mouse. SpeakToText Speech Recognition is a useful application that lets you to dictate text directly into other applications, recognize audio files you create, have documents read to you by your computer, create your own custom speech commands, and chat hands-free with most chat programs including MSN Messenger, AIM Instant Messenger, Yahoo Messenger, ICQ and PalTalk. VR Commander is a state of the art voice command and control program that adds a voice interface to virtually any windows based application.